Formal or informal? Big or small? Bushy or compact? Hedges come in all shapes and sizes and are an enormous part of the British gardening landscape. Hedges are sturdier than fences making them less likely to topple over in strong winds. And by playing host to so much wildlife, some hedges are the horticultural equivalent of high-rise dwellings for native wildlife. But for all their benefits, hedges can be a headache for the modern gardener and home-owner. 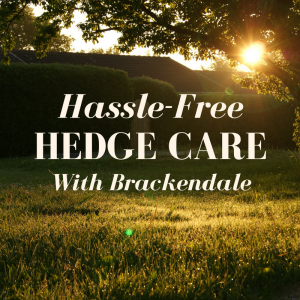 Fortunately, Brackendale Tree Care know plenty of useful tips to help you enjoy your hedges happily. Is Removing a Bird’s Nest from a Hedge Illegal? It’s illegal to damage or destroy a nest that’s being built or used. You can remove it once chicks have fledged which is typically at the end of May. To avoid upsetting broody birds and getting into trouble with the law, closely examine your hedge before you start trimming. If you notice adult birds flying back and forth with nest building materials, or if you can hear young birds chirping for their parents, stay away until later in the year. How Can I Avoid Ugly Bare Patches on Conifers? Fast growing conifers need a lot of attention to stay in check. As they are evergreen they can be trimmed all year round. To avoid unsightly bare patches never trim beyond the new, green growth. Most hedges will not recover if cut back hard to expose the brown. Can Hedges Really be Given an ASBO? Yes, they can! Hedges can cause much ill-feeling within neighbourhoods. Tall hedges that block out sunlight or obscure views, or overgrown hedges that encroach on pavements or roadsides can test people’s patience. Your neighbours can legitimately request you reduce the height or breadth of your hedge if it affects their “reasonable” enjoyment of their home or garden. If the local council agrees your hedge is inappropriately large or unruly and you don’t act, you and your hedge may face an ASBO. It’s best to nip problems in the bud – aim to keep your hedge beneath the height of 2m tall and regularly cut back hedges on the side of the pavement or roadside. How Do I Trim my Hedge? Regular hedge trimming is the order of the day. Use sharp and well-oiled tools and take care of safety with goggles and suitable gardening gloves. A good set of handheld shears will whip smaller hedges into shape, while gardeners with larger hedges may find electric or petrol trimmers to be a good investment. Conifer hedges – trim them 2 to 3 times per year to keep them in check. Do not trim after August. Flowering hedges – prune them after they have finished flowering. Berried hedges – prune after the berries have gone. This is likely to be in the winter. Fast growing formal hedges such as privet – trim every 4-6 weeks to keep them in check. Keep it healthy by trimming the top to be narrower than the base. This will allow plenty of light to get to the bottom of the hedge. Slower growing formal hedges such as yew – trim 2 to 4 times per year. You’ll find a straight line easier to cut if you tie a length of string at the correct height between two posts and cut to that level. Looking after hedges correctly can become a big job, so if you’re short of time or overwhelmed, give Brackendale Tree Care a call. With our no-obligation quotes and expert advice, we’ll help you make the most of your hedge so you can enjoy your garden and home without even picking up a pair of shears.